Answer: Pure LOVE! Your Love Shaker is filled with a lifetime supply of LOVE. Answer: Inside your Love Shaker are kernels of corn that create the magical sound as you shake it. These kernels have also been imbued with loving intention! Note: The kernels can be removed if you’d like your distribution of LOVE be silent. LOVE will still pour out with or without the sound! Hold the Love Shaker to your heart. Think a loving thought and let that loving thought become a feeling that travels through your hands into your Love Shaker. Stay with that feeling until the Love Shaker is fully filled! You can give your Shaker a little LOVE boost whenever you want. You may want everyone who uses your Love Shaker to do this before they use it for an added personal touch of LOVE! Answer: Yes! the Love Shaker has a plug at the bottom (underneath the friendly safety sticker) that can be removed so you can add what ever ingredient you’d like. 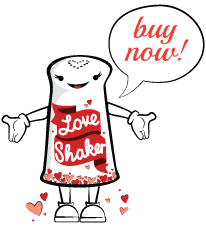 The Love Shaker is perfect to dispense other ingredients like your favorite condiment, talcum powder, bath salts or anything you’d like to lovingly shake into your life!